Located in Athens, Georgia, USA , Brian Smith is a guitarist who combines influences from classical and contemporary genres. He is a founding member of the Georgia Guitar Quartet and side project Revien, both of which have toured extensively and been featured on NPR’s “Performance Today.” As a solo guitarist, Brian performs a variety of genres including traditional classical pieces as well as unique arrangements of pop, country, and world music. 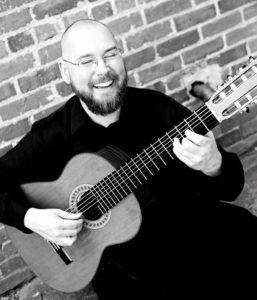 He plays on a 7-string classical guitar made by the Kenny Hill Guitar Co. and uses electronics including a looper and other pedal effects. His performances are both entertaining and welcoming. It’s clear that sharing music with others brings him great joy, and that effect is felt by the audience. I’m not sure that I’ve ever met a musician as kind and humble as Brian. In a recent recording session with videographer Matthew Anderson, Brian plays his arrangement of Cyndi Lauper’s hit, “Time After Time,” as well as an arrangement of a song written by his late friend, Carl Lindberg. Above each video are Brian’s own words. “If you’re lost you can look and you will find me, time after time. If you fall I will catch you, I’ll be waiting, time after time.” To me, these lyrics point to the human ideal. By simply being there for someone with open ears and hearts and responding with loving speech we can heal many wounds within others and ourselves. I dedicate this piece to the monks, nuns and laypeople I had the pleasure to get to know at Magnolia Grove Monastery. It is my hope that we can all learn to see ourselves within every living being and respond with empathy, compassion and loving kindness. May this tune bring you peace! “Hope, love, my people come together!” This piece was written by Carl Lindberg; my arrangement is dedicated to him in the hope that all of us can come together as one people through love, compassion and understanding. May this tune bring you joy! Please share and don’t forget to subscribe to our mailing list. Just found guitarramble web site. Awesome arrangement of Time after Time! Can’t wait to catch you around town again.